Is an English architect who created the majority of his works in the 1960s and the 1970s. 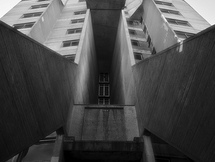 He is known for having designed Brutalist architecture in the United Kingdom, much of which was demolished. The buildings were damaged because their bare concrete structure was exposed to a rainy climate that left rainwater marks on the buildings' facades and turned them grey over time. Another reason for demolishing Luder's works was their neglect. Following the demolitions in the 2000s, Luder received a Rubble Club award for having the best building to be demolished during the architects lifetime. Some of his most notable pieces of architecture are Trinity Square, Tricorn Centre, Derwent Tower and a conversion of a Victorian Fire Station in London. Apart from working as an architect at his own practice of Owen Luder Partnership (est. 1957), he as well served as a President of the Royal Institute of British Architects in 1981–1983 and 1995–1997 and was a chairman of the Architects Registration Board.